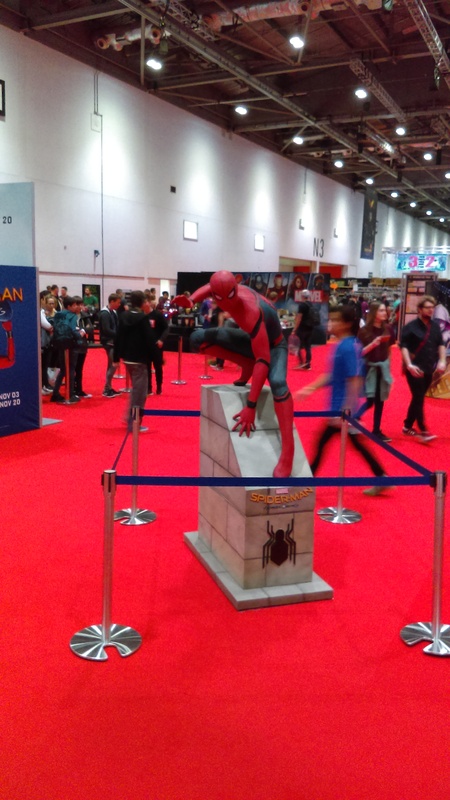 Last weekend was the super busy London MCM Comic Con. For those who’ve never been it’s a massive event at the Excel Centre in London with tens and tens of thousands of people in attendance. I’m always amazed at how many people attend and again it was slightly overwhelming to walk through the vast crowds, many of who were dressed in cosplay. I’ll be honest, I didn’t recognise about 50% of the cosplay because many of them were from anime, computer games I don’t play (you can tell how old I am because I still call them computer games! ), comics and other things I’ve probably never even heard of. Even so it was amazing to see the time and effort that people had put into their costumes. I saw several women with fairy-like wings that moved independently with some sort of motor. Very clever and creative. 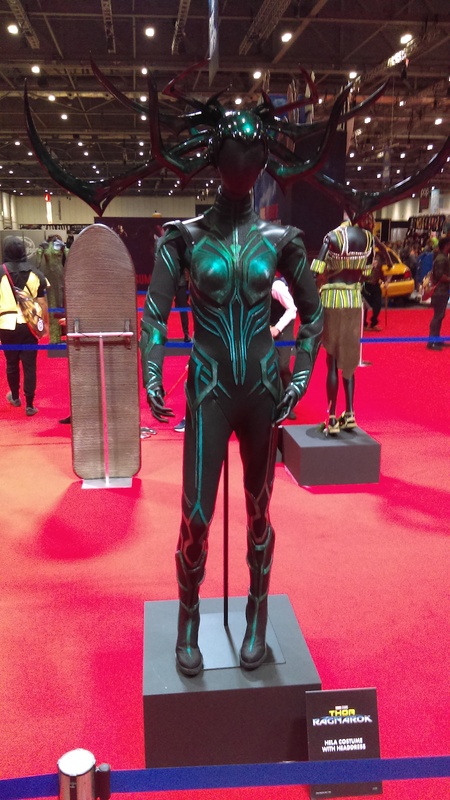 Both Marvel and DC had a presence at the show this year. 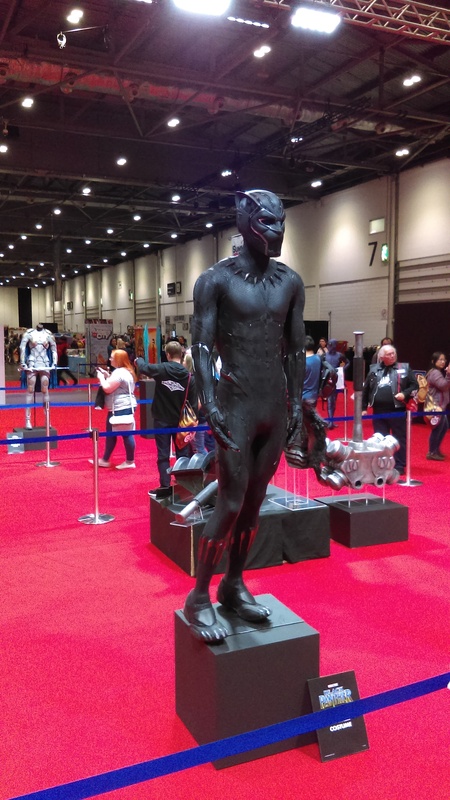 Marvel had taken over a whole section and had lots of cool things you could do, as well as see, including some costumes from the Thor Ragnarok film and forthcoming Black Panther film. 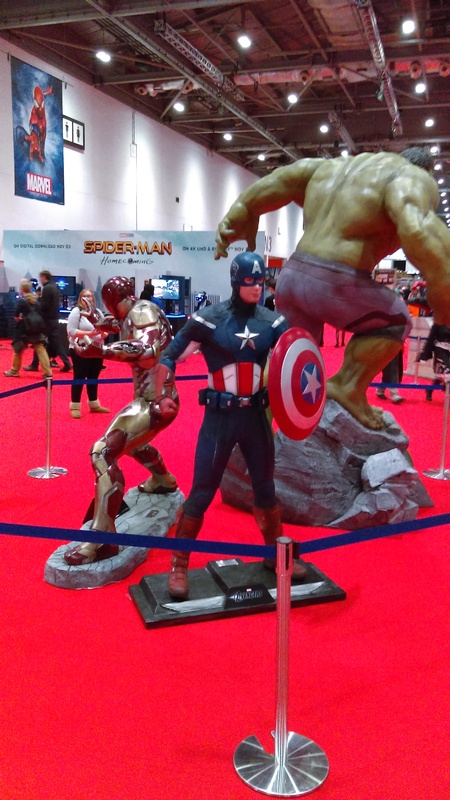 There were also some cool statues of Captain America, Spider-man, Iron Man and the Hulk. When not mooching around the show trying not to buy everything I went to a couple of talks and was delighted and charmed by Hayley Atwell. She was funny, warm and spoke about her time on the Marvel films and Agent Carter with great affection. It was wonderful to hear about how her relationship with various actors, such as Chris Evans, had developed over time as they’ve now worked together in the same universe on several films. 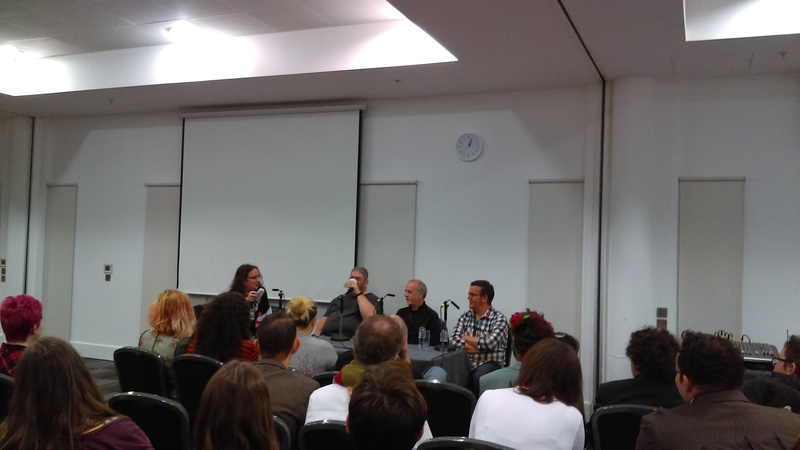 I was also on a few writing panels during the weekend alongside other science fiction and fantasy authors. 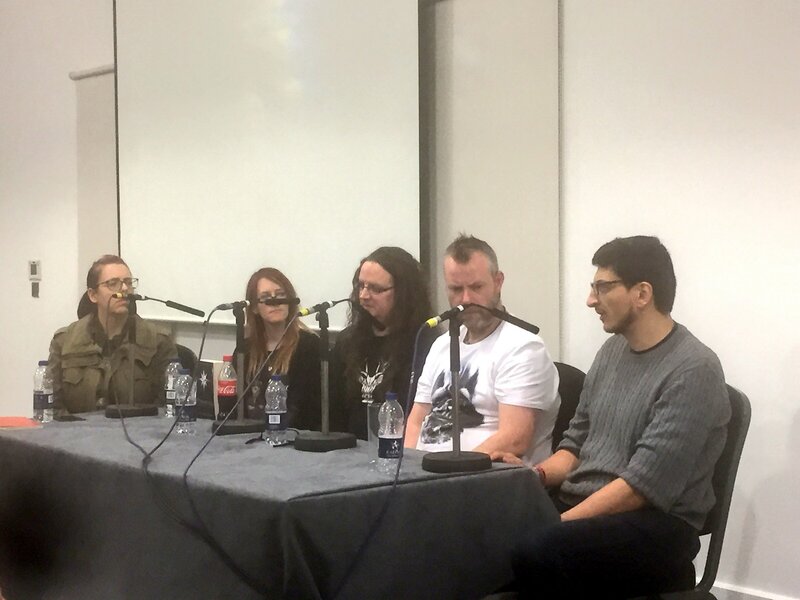 Below are a few photos from our panels ,as well as Ed Cox attempting to get everyone to put on a serious author face. Without a doubt the funniest panel during the weekend was one moderated by RJ Barker. The audience, and everyone on the panel, had no clue what was about to hit them and it was hilarious. Ben Aaronovitch was in tears several times and Guy Adams had a few funny rants. The weekend was a lot of fun. I got to spent time with some old friends, met a few faces and came home exhausted but happy. I must thank Travis from MCM for inviting me back again and maybe I’ll see you at the next event, which is the one day Sledge-Lit festival in Derby on Saturday 25th November. I thought I would do a quick post about what I’m up to at the moment on various things. So, book 2, Bloodmage, is completely done and dusted. My publisher, Orbit books, has just sent me the latest version of the cover and I think it looks really good. So that is all set to come out in April. In about a week’s time the copy edits on book 3, currently untitled, will be coming back to me. I’ve then got a couple of weeks to turn it around and send it back to the publisher. After that, a few weeks later, I get a physical proof. So at the moment I have a window of time where I’m not writing. I won’t lie. It’s weird. After doing it all the time, almost every day, to suddenly not be working on a novel seems odd. Not writing at all doesn’t sit right with me, so I’m writing down notes for the next big thing. In theory it will be a new trilogy, but it is very early days, so that might change. In the meantime I’m also working on what is currently a novelette, but depending on how long it runs, it might turn into a novella. It’s set in the same world as the Age of Darkness, and it shines the light on a couple of characters. It is an interesting side adventure they went on together. Chronologically it’s set before Battlemage, so it doesn’t spoil anything, but if you’ve read book 1 already then there are pay-offs. I’ve just finished doing an Author roundtable Q and A over at SFF World which you can read here. The questions were mostly about process and more general as there were three of us. The comic book projects roll on. Flux, co-written with Pete Rogers is going well. We’ve just finished the Issue 3 script (out of 4) and we’re fairly happy with it. Artwork for issue 2 is still coming in and we’re going to start working on Issue 4, and extra content soon. I’ve also got about nine ideas written down for some other mini series and am having trouble deciding what to pursue next. I think a bit of a head to head Skype chat with Pete is what is required. The podcasting is still going well. I have monthly chats with Scott for CBO and the same with Pete for Bags of Action, where we talk action movies. Later this month I’ll be doing face to face podcasts with both of them, which will be weird, as you learn certain rhythms when doing it over the internet. Seeing the person talk is just odd. Pete and I recently saw Creed, so we’ll be talking about that very soon for Bags. We’re both big fans of the Rocky franchise so it will be an interesting discussion. Soon I’ll be announcing some events in the UK for the launch of Bloodmage in April, so keep checking back. The first of these as gone up already on the Events page, and I will add more when confirmed. I suspect I’ll be attending a couple of conventions this year but I’m not sure where or when yet. Pie in the sky idea for 2017 is to attend NYCC in October, but right now it’s just a cool idea. Let’s see if it actually happens. This month has been crazy busy. I’ve just moved house to a new area, am still neck deep in boxes, my job situation has kind of changed, so there’s been a lot of adjustments to make. And a lot of stress from the house move too. Looking in the mirror I definitely saw more white in my hair after an awful moving day, but that’s another story. In the meantime, I’m now kind of in my second act as a writer. The first trilogy is done, for the most part. Book 1, Battlemage, is out there in the wide world. Book 2 is completely edited and now is with the publisher to turn the manuscript into a real physical book. I’ve not seen a cover yet for Bloodmage but that is in the works too. The first draft of book 3, yet to be titled, is with the publisher for review, so that leaves me to ponder what next. I’m thinking it will definitely be another trilogy. I’m setting it in the same world, a few years after the events of the first trilogy and right now I’m pondering a few different ideas. Part of me is panicking that I’m not writing, because for the last two years I’ve always been writing. There hasn’t been a week where I wasn’t writing, in order to meet my deadlines. Now I’m doing that purely thinking thing while not writing something else, and I’ve not done that in a few years so it’s weird and in some ways feels like a step back in time as I’m now working without a deadline. I’m also trying to do the relaxing thing. Whatever that is! But it is kind of important for lots of reasons, not only to recharge my batteries, but also the more I feed my brain good stuff, the better it seems to work as good story feeds it. Whether it’s TV, books, films, comics or even games, engaging with good stories and good characters makes me want to rise to the occasion. I’m also trying to sleep more than before, which should also help rest my brain a bit. So it feels like I’m on holiday in a way. The day job is also keeping me busy, which is actually good, because my brain ticks along in the background while doing something else and ideas creep through the cracks while at work. So I’m often scribbling down notes. Sitting at a desk hammering my head against the keyboard for 20 hours straight will not work. It never has. So I’m trying to remind myself that everything I’m doing right now is normal and natural and that I’ve been here before. But it still feels weird. In the meantime, I’m busy with a couple of events. Tomorrow I’m at SLEDGE-LIT, a one day event in Derby. And on December 10th I’m doing my first AMA over on Reddit Fantasy, so pop by and as the title says, ask me anything about writing or real ale or whatever you fancy. This bank holiday weekend I’ll be at Eastercon or, Dysprosium, as it is called this year, the 66th annual event where SFF fans gather to drink, I mean, talk about books and stuff. This year there are some exciting and interesting guests of honour that I’m looking forward to meeting, but I’m actually more excited about meeting up with friends. These are people I only get to see maybe once or twice a year. You can’t choose who you work with and I have often ended up in an environment for my day job where I’m lucky if one person shares even one of my passions and most often the number is zero. At a convention I have something in common with almost everyone and it’s a great place to just geek out, relax in good company and have all of those important conversations like, why Batman is so much cooler than Superman. It means I can get into the nitty gritty on certain characters or novels, and rake over stuff with a fine toothed comb if I want and no one will suddenly switch the conversation to their children, or pensions, or football, because they can’t join in and have no clue what I’m on about. Conventions are a great place to belong and find your tribe. They are a great place to relax where I can be myself and I don’t have to hide what I enjoy as there’s no mockery. 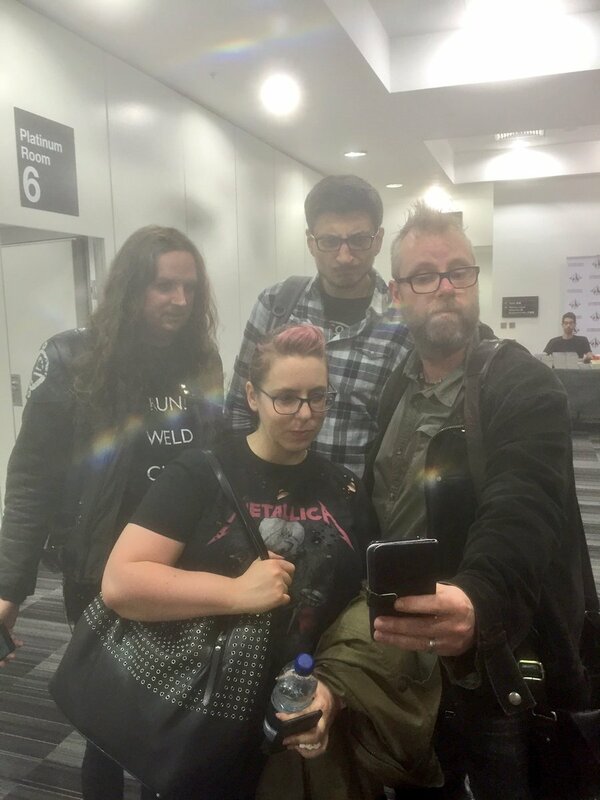 I can’t choose who I work with, but I can choose who I spend my free time with and, geek conversations aside, I find the people at these conventions are always well read, thoughtful and intelligent. Sadly there are always a few bad apples, and the convention organisers work very hard to prevent issues so that everyone can have a good time, but generally the atmosphere is relaxed. So if you’ve not been to one of these events before I would encourage you to do so, as you’ll probably meet a lot of like-minded people who share your passions, and you’ll come away with some new friends. If you see me at Eastercon at the weekend, come over and say hi and we’ll sort out once and for all which is better, Marvel or DC comics. As mentioned last month, the Podcasting network I am involved with has had a face lift and a kick in the pants, and now we are back on track with a regular schedule and more new content. CBO – Episode 170 – In honour of our first guest on the new Crash Landing, our main feature is about our favourite detectives from film and television, plus all of the latest news from geek culture. Bags of Action – Episode 17 – Big Trouble in Little China – the classic John Carpenter, Kurt Russell film about weird things going bump in Chinatown. It’s a film full of weird magic, karate kicking, cheesy one liners, weird CGI things, flying men, swords, guns, lots of punching and even the odd romantic moment! Crash Landing – Episode 1 – The first of a new monthly podcast. Every episode we maroon a guest on our crashing spaceship. They have one hour to salvage humanity’s most important cultural artefacts before they crash land on the planet of their choice. I’ve been podcast for over seven years now and the landscape has changed dramatically in that time. When we started not many people really knew what podcasting was and the number of podcasts and people listening was a fraction of what is today. Coming up on eight years on from when we first started in July 2007, my co-host and I have done all sorts with the podcast and it has led to all sorts of opportunities, personally and professionally. 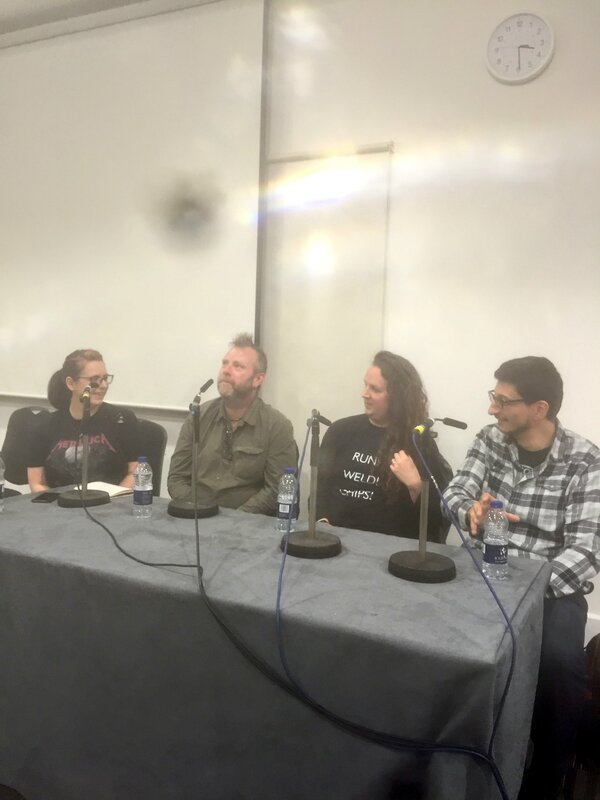 I’ve attended comic book conventions and spoken on panels about podcasting, their place in the new media landscape and taken part in discussions about whether or not it’s a form of journalism. I also co-ran the podcasting track at the Nine Worlds Geekfest convention last year and will be involved again this year. Professionally I’ve used the editing and sound skills I learned from a hobby in two of my jobs. One was to introduce podcasting to a large global company who wanted to keep their employees up to date in a way that was mobile. So I trained a couple of other people on good technique, introduced them to the software and how it works, and off they went. I’ve also used the same skills for video editing and my voice has been used on several demonstration videos which I put together. On a personal level, podcasting has allowed me to speak with some amazing creative people, writers and artist from several mediums, plus independent filmmakers. This was sometimes on the Book Club where we spoke to authors, and sometimes on Comic Book Outsiders. We’ve now reached the point where after so many years we’ve settled into a rhythm and are still enjoying what we do. With that in mind I thought it might be worth giving a little bit of information about the podcasts I’m involved with, as part of our mini podcasting empire! Comic Book Outsiders – Once a month I co-host this comics and geek related podcast with Scott. This was the original podcast we started in 2007 and we are still going. We talk about things in the news, comics books, TV, films and games, we discuss meaty topics, we have guests on to talk about their work and we highlight hidden gems that don’t get as much attention as they should. Bags of Action – Once a month I co-host this podcast with Pete Rogers. If you love action movies then this is the podcast for you. We talk about the ridiculous stories and the wonderful chaos common to this type of movie. From gun fights that go on forever to fist fights that defy gravity and common sense. Every month we discuss and dissect an action movie and always have a good time recording it. Sometimes we go off the rails a bit and dig into some of the trivia, or we just wander off into other areas if the film is poor. Crash Landing – Once a month Scott sits down with a special guest. Fortunately they have been rescued from a dying earth. Unfortunately the rocket ship they are on is going to crash land. They have to decide which popular media they want to save, books, films or comics, or a combination of all three. What could they not live without on their brave new world? As well as talking about why they love their choices we find out more about our special guests each month. The website for the CBO network has more information on all of the podcasts, plus ways you can get involved and even support the podcasts. It’s all on iTunes as well so give one or more of the podcasts a try and let me know what you think. Writing is normally a very solitary thing. You sit alone and create something while staring at a screen. You can go out and write in public (if you can write in a busy and noisy environment) but it doesn’t change that it’s still just you alone in your head. As a writer of fantasy novels, I spend a lot of time writing alone and I’ve always envied the writers’ room style I’d often heard about that’s common to TV. A group of people get together in a room for hours and hours, they brainstorm ideas, then break it all down into story arcs, episodes and even character arcs. It’s a group mind meld where the power of many brains outweighs the creative output of one. In recent years I’ve been co-writing comics with a friend of mine, Pete Rogers, and we have both enjoyed the process of writing together. I should say that obviously further down the line of making a comic book it does involve other people (and it’s the same with novels) but at that initial story-burst stage, where you are throwing stuff out there, it’s normally just you. Every day I drive 2-3 hours to and from work, and as a result I consume a lot of podcasts. Several of those I listen to feature creative people in comics, TV and film talking about their projects, but also their process and how they got started in their industry. Once again I heard several examples about the joy of a writers’ room and the unusual dynamic it creates. That itch was still there and I wanted to find a way to scratch it. But I don’t work in television and have no experience in that business, and no-one was going to invite me onto their staff just because I asked. So the next logical thing was to try a writers’ room approach to creating a comic book. It’s not completely new and unheard of in the industry, but it is uncommon. At the most recent Thought Bubble convention I pitched the core underlying series to a couple of writers. They were intrigued by the initial idea and where we could go with it, and they said they were interested. Then they looked at me slightly askance and perhaps with some bafflement when I said I wanted to approach it with a writers’ room style. A couple of weeks after TB we got together online for a group Skype call. As I came up with the idea, I would act as the showrunner, as it were, so although we all had equal ownership and it became our idea, there still needed to be someone guiding the conversation. I was nervous but shouldn’t have been. I was careful in who I had approached because as well as being creative they were people I knew I could work with. My writing partners on this project are Pete Rogers and Cy Dethan. On the first call we laid out the initial rules of the story and its framework. We established some goals for the short term and scheduled to meet up a month later and carry on from there. In that first call, which was less than two hours long, we accomplished more than Pete and I had done as a partnership in months. When I came off the call I was buzzing with excitement and energy and keen to get to work on the series. From speaking to the others I know that it also energised them. Since then we’ve had a number of calls and each time we’ve moved the story on quite a bit in a short space of time. We’ve created a story arc, broken down the themes and then more recently we all came in with several ideas and pitched them to each other. We all said which we preferred and now we have several strong ideas to turn into first draft scripts. As a group we’ve accomplished so much already and it’s proven to be an incredibly rewarding experience. We’ve all forced each other to be better, but also we’ve helped each other improve on our initial ideas and tease out details. I can’t wait to see where we go with this first mini series but I hope it’s just the start of something much bigger. Quick general update. This month has been flying by. It’s been super busy in the day job, and I’ve been stacked up at night with various things. Probably the most exciting news is that the proof of Battlemage is done! I spotted a few things, had a few more fed back to me from the publisher and I’ve sent back my comments on them. So that’s it. I’m done. That’s a wrap! There are some tweaks to be made to the cover, but that’s not up to me and I’ve already sent in my comments. So now book 1 is completely finished for me (there’s still the whole printing and binding thing, but it’s probably not a good idea for me to do that!) and the next time I see it, Battlemage the book will be a thing. A physical artefact that I can hold in my hand. The final sum total of years of work by many people. It’s very scary and also the prospect of seeing the book is one of the most exciting things in my life. It is literally a dream come true. So now I’m trying to get my head back into book 2, then send that off and I will hopefully have a gap of a few months to sink back into book 3 and make some good progress. Other stuff, episode 169 of the Comic Book Outsiders podcast is out now which I co-host. We talk about some of the latest geek news, and then in terms of comics we revisit The Fuse, Letter 44 and Southern Bastards. Also episode 18 of Bags of Action is out, part 3 of our trilogy to Arnie and we discuss Predator, a classic film of the late eighties. The newest comic book project I’ve been working on, and actually the one I can say the least about, is proving to be the most exciting and it is racing ahead. It’s proving to be both incredibly challenging and also very rewarding because of it’s unusual nature and the approach. Hopefully I can share some more details about this soon. So, in the meantime, it’s back to work on the second draft of book 2, enjoying the current mid-season break of TV shows as I have less to distract me. 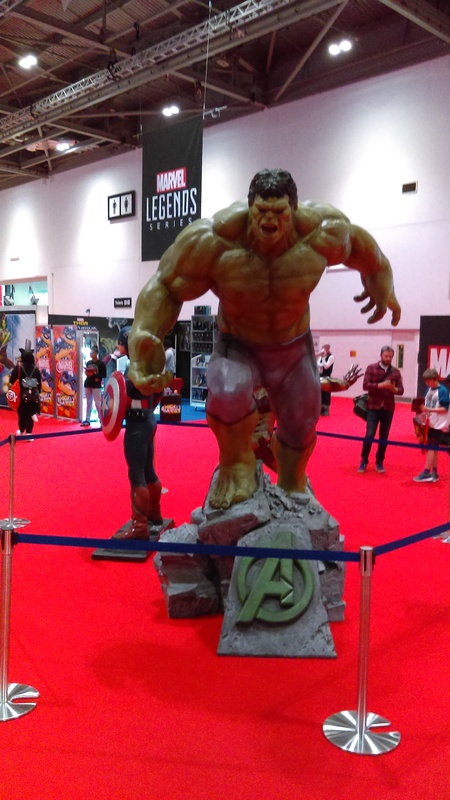 In April it all kicks off with Eastercon, Dyprosium, Avengers 2: Age of Ultron, and a bucket load of new Marvel Lego to go with it. Lots of awesome stuff to look forward to. Last weekend was the Thought Bubble comic convention in Leeds. What started out as a small one day event in the basement of town hall with maybe twenty five tables, has grown into a two day event with a couple of hundred tables spread out across three halls. A few years ago it relocated to a different part of the city with bigger facilities, and more space for guest talks and panels. 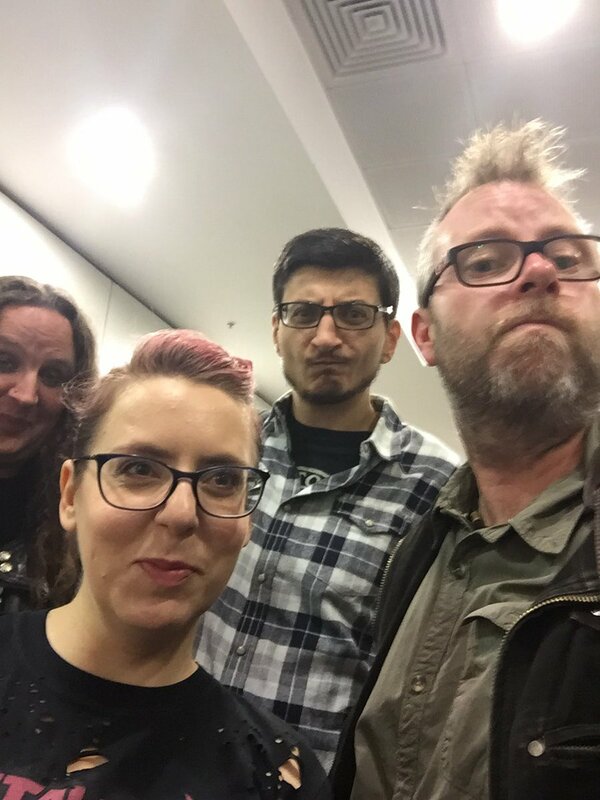 The first year there were predominantly UK comic book creators, but now every year the organisers bring over several big names from overseas. A couple of years ago one of the biggest names was John Romita Jnr, last year it was Mark Waid and Jason Aaron, this year there were several well known creators including Gabriel Ba and Fabio Moon, Matt Fraction and Kelly Sue Deconnick. As well as well known writers and artists, there were many inkers, letters and colourists, and several editors from comic book companies including Marvel, Image and Titan, who offered art portfolio reviews. So there’s a real spread of creators, and I’ve not yet mentioned the many independent comic book creators from across the UK and wider afield who were there with their books. Thought Bubble is a purely comic book focused convention, so there are no games, TV or film people. The two day con is part of a larger week of events in the city, but the weekend is purely comic book focused. I’ve been going since the first year and have seen it grow significantly. Relative to US cons it’s still very small, and it’s smaller than some of the big London conventions that mix together comics, TV, film, video games etc, where you might get 5-10 thousand attendees over the weekend. I believe Thought Bubble is nowhere near that, but that’s fine, as it makes it a more intimate and less pressured convention. The big named creators had constant lines for signings and sketching, so they were working hard all weekend, but I suspect it was not as tense or stressful as the US cons. Every time I speak to people about the convention they all say it has a very unique vibe to other UK comic cons and many have said it’s their favourite. Overseas visitors have also said how much fun they had and maybe it’s because there isn’t a wall between creators and fans. During the day they’re behind tables and fans are in front, but at night everyone is usually in the same place, fans and creators. Last year I stood behind Jason Aaron as he had a drink and a chat with his friends and I did the same. I could have gone up and introduced myself, said hello and that I liked his work, but I don’t know him, and I could have done that during the day. At night he was relaxing with his friends, so I didn’t bother him. People didn’t swamp any of the big names. They were there, in the crowd, talking with people and having a good time, but people just left them alone. Maybe it’s a British thing and we’re overly polite. For us it’s not uncommon to see Kieron Gillen spinning his disks and being the DJ for the party, or seeing Al Ewing shaking his stuff on the dance floor. This year I was introduced to someone by a mutual friend, I shook his hand, said I enjoyed his work and we chatted for a little bit, and then he and his friends went to the bar. He was one of the big names from this year but I’m not going to claim we’re now best buddies or that I know him. 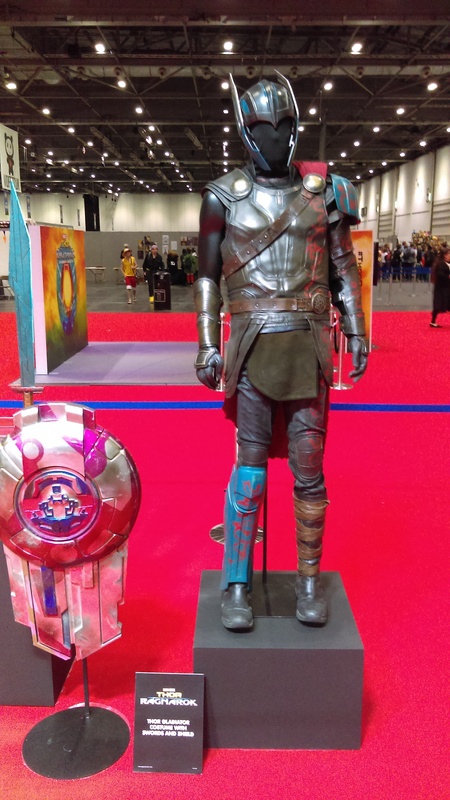 The convention certainly has an interesting dynamic, but this sort of inclusiveness is common at UK comic cons like Bristol and previously the Birmingham comic con. For me the convention has become more about catching up with people than the comics. I like browsing the halls and seeing what’s out, but it’s at this event I’m able to catch up with a group of people I might only see once a year in person. I talk to lots of them online via social media and email, even Skype with some, but it’s just not the same. So it was great to catch up with old friends, share stories of the year gone by over a pint, speculate about the future and discuss our plans and ambitions. The convention is almost at year end, so it’s a good point for me to become a little reflective and look back over the last ten months or so. As a slight aside, although my co-host Scott and I have not hung up our podcasting microphones, and we now put out episodes as and when we want to, it was nice that several people mentioned to us that they still listen and enjoy the show. As various comic book projects creep forward, I am hopeful that by Thought Bubble next year I might be behind a table, but I guess we’ll have to wait and see. As ever and when I can, I’ll post updates on various writing projects. One year I’d like to visit one of the big US comic conventions, to experience the chaos and madness, to swim through the seemingly endless crowds and see how much they differ from UK conventions. But for now, I’m happy to spend time at UK cons like Thought Bubble which are inclusive, familiar and a great deal of fun. I’ve not posted in a bit as ever since I came back from WFC I’ve been pretty busy with various projects. So just a quick round up of what’s going on at the moment. The game is still in the testing phase, I just received a message to download another version for me to play with. So it’s still moving forward which is great, and I’m 99% it will be out next year. More info when I have it. The day after I got back from WFC I received the next round of edits from my agent on the novel. So I’m currently hip deep in them, whittling, chopping, refinishing and polishing for all I’m worth. Lots of massaging stuff, trimming out extra bits that, at the time I thought were cool, but now they’re just extra weight and they slow down the main story. Not sure how long I will need for this, but I’m aiming to get it all done before the Christmas holidays so I can switch off this part of my brain for a few days. Apparently not content with the number of existing comic book projects I had on the go, I approached my co-writer on Flux, Pete Rogers, with another idea. We bashed it around, whipped it into shape and then approached an artist we’d both been chatting to for a couple of years via social media. We told him about the idea and what we wanted to do with it, and that was it, he was onboard. He’s currently working on another project, but that hasn’t stopped him from doing character sketches for us in his spare moments. So I’m delighted to say Pete and I are now working with Near Death artist from Image comics, Simone Guglielmini. 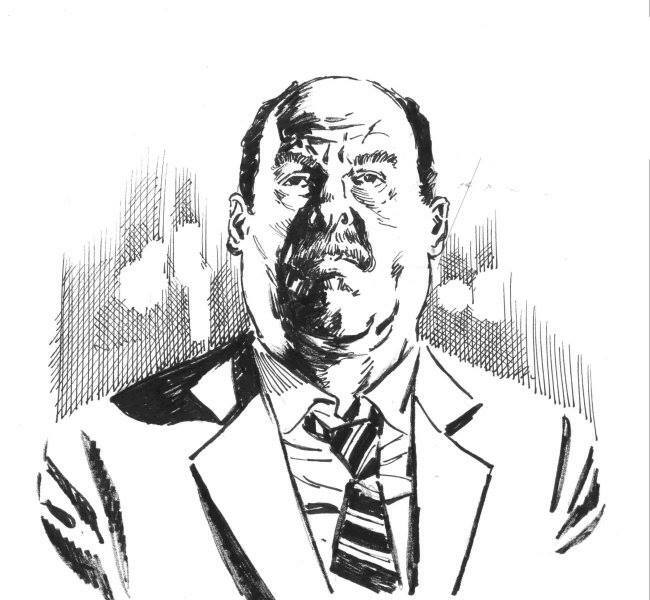 So, above is a rough character sketch from Simone for a cop called Killian. At this early stage I can’t share too much, but I can say it’s a creator owned action thriller mini series written by Pete and myself. We’ll be submitting it to publishers next year. Flux, the second project co-written with Pete is still moving forward. Our artist Maysam is busy working on issue 1. I previously posted a part of artwork so dig back through previous posts for that if you want to see it. Comic project 3 – This is the new project with Adam Bolton. Very early stages. We bashed around various ideas until we settled on something we both liked. It’s wacky, weird, and a lot of fun. Currently waiting for Adam to come back with some preliminary sketches. Thought Bubble, the comic book convention in Leeds takes place in two weeks, so I’m hoping to have a catch up in person with Adam who is attending the event for the first time. Comic project 4 – This is a supernatural crime mini series, and again, I’ve developed it to the point where the artist attached is now working on the cover for issue 1 and the first 5 pages to create a submission packet. We’ll be submitting this next year to publishers. So, as ever, there are lots of things ticking along and I poke various projects to keep them all moving. Also a couple of other longshot, long-term projects are ticking along, but right now most of my spare time is focused on the novel, getting my head back into that space, going through it at a micro level but also a macro level. Stepping back and saying, does this make sense? Does this flow? Do I really need this or do I just want it? Lots of angst, chewing my nails and anxiety. Fun!